Recommended for use whenever future paintability is a concern. Sil-Seal 9500 exhibits excellent adhesion to many substrates including aluminum, brass, steel, glass, granite, marble, wood, and many plastics. This product is designed to eliminate the use of water based sealants such as latex and acrylic latex were cracking and shrinking have occured in the products. 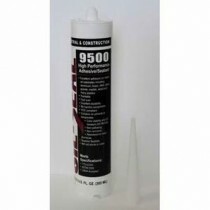 Sil-Seal 9500 contains no solvents or isocyanates and is non-yellowing. Authorized by the USDA.